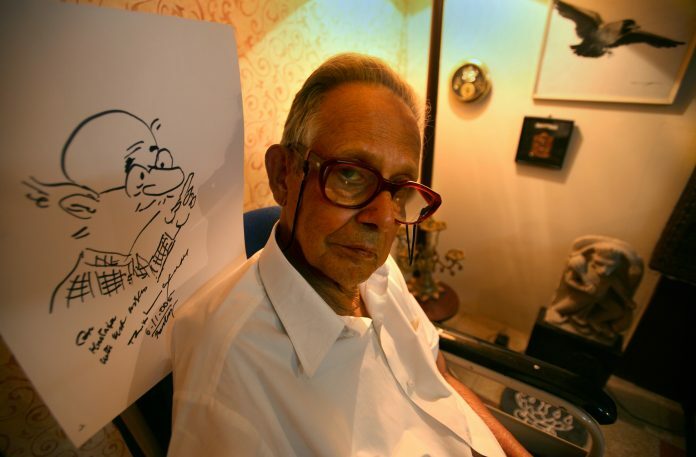 R.K. Laxman, known for his biting satire, was rejected by the J.J. School of Art in Bombay. He then studied philosophy, economics and politics. New Delhi: Known for his wit and artistic vision, R.K. Laxman will be forever associated with The Common Man, the bespectacled, dhoti-clad elderly character who was the cornerstone of Laxman’s biting satire. As we celebrate his 97th birth anniversary today, let’s take a look back on the life of the cartoonist who never held back with his satire of the country’s socio-political atmosphere. Born in Mysore in 1921, Rasipuram Krishnaswami Iyer Laxman was the youngest child in his family. Laxman’s father was the headmaster of a high school, which allowed the budding artist to interact with people from different backgrounds, including actors, writers, dancers and many more. His artistic career, however, had a stuttering start. He recalled in an interview with MoneyLife that when he had applied to the J.J. School of Art in Bombay, his application was rejected with the note, “you show no talent, we can’t accept you”. Laxman then went on to study philosophy, economics and politics at the Maharaja College in Mysore. But from drawing people in the marketplace on everyday to illustrating for his brother R.K. Narayan’s stories for The Hindu, Laxman always knew he was destined to be an artist. His first full-time job was with The Free Press Journal in Mumbai, where he worked as a political cartoonist with Bal Thackeray. From there, he went on to join the Times of India, which led to the creation of his most famous the ‘Common Man’ character who bore witness to the travails of Indian democracy. Although his Common Man had a witty and sarcastic approach to India’s politics, the cartoonist was always lauded for never being toxic in his approach. The cartoons featuring the Common Man went on to become the basis of a comedy series on Indian TV, R.K.Laxman ki Duniya (2011-13). Laxman went on to publish numerous short stories, essays, travel articles and also wrote the novels The Hotel Riviera (1998), The Messenger (1993) and an autobiography, The Tunnel of Time (1998). He was conferred the Padma Vibhushan in 2005. Honoured with Ramon Magsaysay Award for Journalism, Literature and Creative Communication Arts in 1984, Laxman was also given the Lifetime Achievement Award for Journalism by CNN IBN TV18 in 2008. Although the veteran passed away in 2015, his work keeps his name very much alive today. Such was Laxman’s vision and knowledge that even today, his cartoons hold great relevance in contemporary society and carry on his legacy.